PI Dry is on the case. 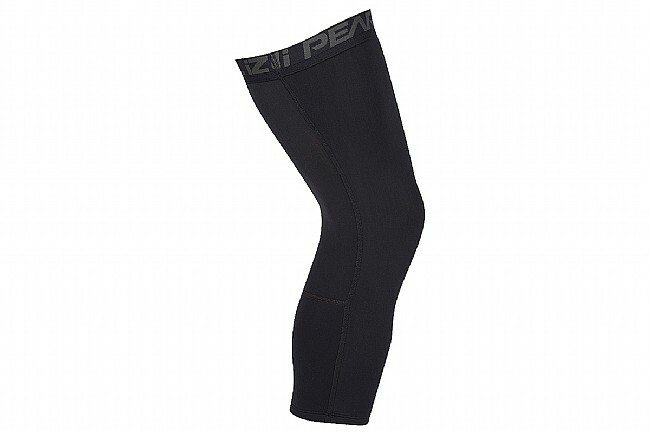 With their Elite Thermal Knee Warmers, Pearl Izumi proved that a little coverage can go a long way. Now they've set their sights on all-weather riding, updating the Thermal Fleece fabric with their new PI Dry™ to block out the rain. The anatomic construction eliminates bunching, chafing, or pinching during your pedal stroke for a more comfortable fit, complemented by the plush, wide elastic band and silicone grippers keeping things planted. Thermal Fleece fabric provides insulation, while PI Dry™ technology seals elements out. Anatomic design supports muscles of the leg through pedal stroke. Wide elastic binding with silicone grippers for a secure fit. BioViz™ reflective accents for improved low-light visibility. These are thicker than summer weight lycra that you see on bib shorts, etc., and seem thicker than previous years' models. YMMV but I use them down to about 45F. The limiting factors are the thickness of the accompanying shorts and socks, not this knee warmer. These knee warmers are great for days when the temps are in the 20-40 degree range for those that dont like the full leg warmers. These are the most comfortable, warm, and durable warmers there are. Easy to remove mid-ride if you get too warm. They roll up and tuck in your jersey with ease. Well marked with R and L labels too.